Water Retention Basins in Ontario located north of SR60. Given constrained supplies in Southern California, water is a precious commodity that is critical to the City’s ability to achieve its Vision. There are four sources of water in Ontario: groundwater, imported water, recycled water and local precipitation. Ontario’s potable water supply comes predominantly from a combination of groundwater and imported sources. Recycled water is available for non-potable purposes in portions of the City. Some urban run-off is captured and used for recharging the aquifer, but most travels through the City during storm events via natural and man-made systems to Prado Dam. Protection of ground and surface water quality is important to the continued availability of the resource. 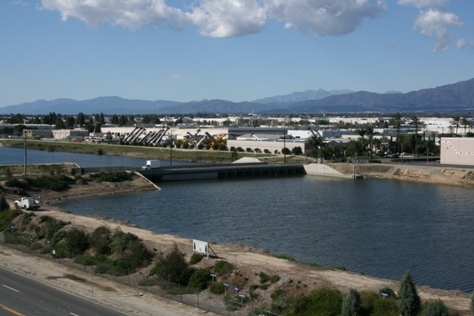 Wholesale recycled water is available through the Inland Empire Utilities Agency (IEUA) for distribution by the City. The City maintains a wastewater collection system and contracts with the IEUA for wastewater treatment. IEUA also operates an industrial non-reclaimable wastewater system, which runs through Ontario and is available to our industries. A reliable and cost effective system that permits the City to manage its diverse water resources and needs. Local Water Supply. We increase local water supplies to reduce our dependence on imported water. Matching Supply to Use. We match water supply and quality to the appropriate use. Conservation. We require conservation strategies that reduce water usage. Supply-Demand Balance. We require that available water supply and demands be balanced. Groundwater Management. We protect groundwater quality by incorporating strategies that prevent pollution, require remediation where necessary, capture and treat urban run-off, and recharge the aquifer. Urban Run-off Quantity. We encourage the use of low impact development strategies to intercept run-off, slow the discharge rate, increase infiltration and ultimately reduce discharge volumes to traditional storm drain systems. Urban Run-off Quality. We require the control and management of urban run-off, consistent with Regional Water Quality Control Board regulations. Wastewater Management. We require the management of wastewater discharge and collection consistent with waste discharge requirements adopted by the Regional Water Quality Control Board.